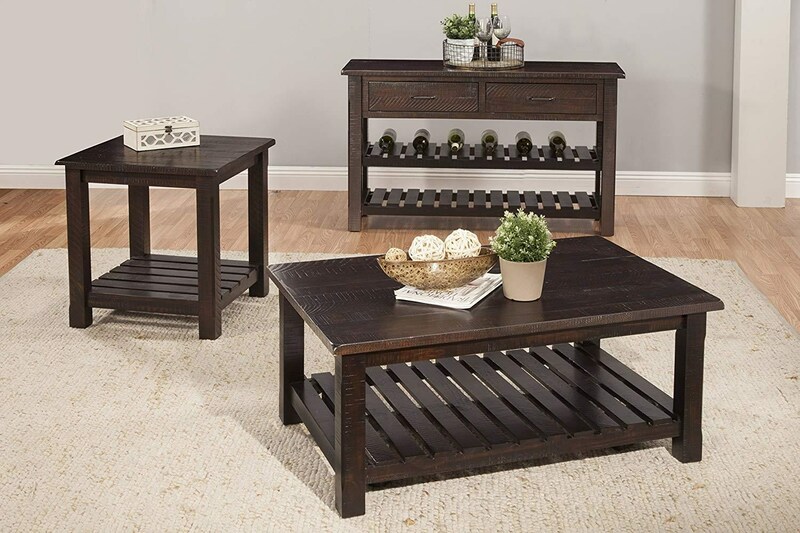 The Hillsboro Occasional Tables Rustic Espresso Coffee Table and 2 End Tables by Martin Svensson Home at Sam Levitz Furniture in the Tucson, Oro Valley, Marana, Vail, and Green Valley, AZ area. Product availability may vary. Contact us for the most current availability on this product. The Hillsboro Occasional Tables are beautiful casual farmhouse/cottage styled table with a hint of a rustic touch. Finished in a Rustic Espresso finish and constructed of solid New Zealand radiate pine with rough-hewn saw marks. Additional details include soft rounded corners on the top while the legs are beautifully detailed with chamfer cuts. The bottom shelf is designed with slats to further complement the tables' farmhouse look while offering additional storage space. Coffee Table has hidden caster wheels are included allowing you to move the table to different positions, which is perfect for a motion sofa or chair. Sofa/Console Table has two (2) slatted bottom shelves an additional design feature allows for up 12 standard 750 ml wine bottles to be safely stored between the slats on the Bottom two shelves. The versatile design and look allows for the console table to be used in the living as a TV stand for TVs up to 50" or in the dining room as a server or buffet. The Hillsboro Occasional Tables collection is a great option if you are looking for Casual furniture in the Tucson, Oro Valley, Marana, Vail, and Green Valley, AZ area. Browse other items in the Hillsboro Occasional Tables collection from Sam Levitz Furniture in the Tucson, Oro Valley, Marana, Vail, and Green Valley, AZ area.